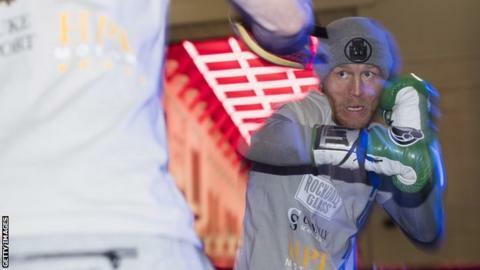 WBO world lightweight champion Terry Flanagan will target "big names" if he successfully defends his title against Petr Petrov on Saturday. Flanagan, 27, is unbeaten in 32 fights and believes taking on elite fighters will upgrade his reputation. One contest he has campaigned for is two-weight world champion Vasyl Lomachenko. "I want to start testing myself against the best," the Briton told BBC Sport. "There's no point saying 'I'm the best' if the people I'm fighting aren't." Manchester-born Flanagan has been touted as a future opponent for Jorge Linares, the WBC and WBA champion who beat Britain's Anthony Crolla last month, and his promoter Frank Warren wants to reward his fighter's ambition. "He's been on the phone to me a lot. He says he wants to fight Linares. He wants to fight Vasyl Lomachenko, which surprised me," said Warren. "But if he gives a good account of himself and comes through on Saturday, we'll try and get him a fight with either of them two next." Standing in his way of those contests is former world title challenger Petrov, 34, who has only been knocked out once by Marcos Maidana, the Argentine who lost to Britain's Amir Khan and Floyd Mayweather twice. "I've got the power to take him out but Petrov's durable, fit and his hands are always busy," said Flanagan. "It's hard to knock someone out when they are determined to win a world title away from home. It's hard to beat a man who has set his sights on that. "I know there may be some close rounds that I will lose, but I will definitely make sure I get the win at the end." Flanagan has the best unbeaten record compared to any other current world champion in Britain but he is still a relative unknown to the wider public. Warren nicknames him 'the quiet man', but believes Flanagan's attitude will change the public's perception of the sport. "In the recent months, we've had a lot of foul language and stunts in boxing that really aren't needed. It's been very unsavoury," said Warren. "That's not Terry at all. He does his talking in the ring. If he was to be a bit of a Jack the lad and rude to people, maybe he would've been better known in the public? "But I think that's all going to change. The 'quiet man' as we call him will go out there and make a lot of noise." Is boxing's Manchester derby possible? One potential big fight that has been suggested is Flanagan against his former school mate Crolla in an all-Manchester bout. But, despite a reported £1m offer, Flanagan thinks the fight is dead after Crolla's two defeats by Linares. "I don't think it will happen," he added. "We asked for the fight when he was world champion and we got turned down. "He needs to build himself back up now before a fight with me, or it might not happen because I'm looking at bigger fights or I may move up to light-welterweight. "We always want big fights now and I know the public still want it, but it isn't a fight we're looking at. I want unification fights."